Migraine headaches are legendary, but there's Good News - Migraine help and stress headache relief may be only a dentist visit away! BUT ONLY if you have medically diagnosed migraine or stress headache. What causes a migraine or a stress headache? To put it simply - for a LOT of people, it's clenching and grinding your teeth, particularly at night! AND BEFORE you say that you DON'T clench your teeth at night - how do you know? You're asleep! Most people DO clench their teeth while sleeping, to one degree or another. Some people clench and grind their teeth in their sleep much more than others. 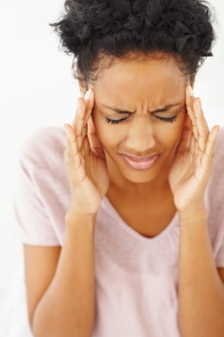 Migraine headaches can also start after a traumatic incident, like a car accident. Veterinary surgeon Dr. David Urch suffered bad migraines after a car accident. No treatments seemed to help much. After a chance remark by a friend, he started taking an aloe vera based food supplement. It was Forever Living Aloe Gel drink. After 3 months, he noticed a dramatic improvement in his quality of life. Migraine headaches occurred much less frequently, and when they did they were much less intense. Read more about this natural therapy HERE. Whether you get headaches or not depends on HOW TIGHTLY you clench your teeth, and FOR HOW LONG. Of course, you have no control over this. During the deepest phases of sleep, your unconcious brain is in control. And you have no idea what is going on - you could be clenching your teeth with 3 to 4 times the normal force! If you clench your teeth intensely while sleeping, there is enormous stress on the muscles and bones around your head. And I mean HUGE stress. In some people, this can trigger migraines or stress headaches. 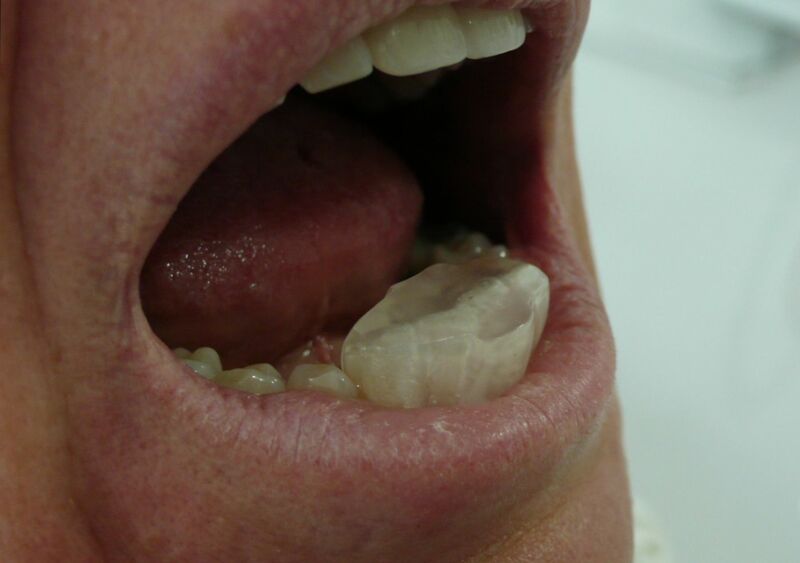 You can read more about the other symptoms of teeth grinding at Grinding Teeth Symptoms. Over the last 35 years as a general dentist, I have come across several therapies designed for migraine help. But only ONE of them seems to work almost every time. AND this migraine help is actually licensed in the U.S.A. by the FDA (Food & Drug Administration) as a migraine therapy! It is the smallest splint I have seen, and also the most effective. This little device is called the NTI-tss. It was designed by californian dentist and pain specialist Dr. Jim Boyd. Jimbo used to suffer from intense migraines for many years, driving him to find a solution. He succeeded, but has had to overcome scepticism from the dental profession. This is a similar situation to that of the "father" of dental implants, professor Branemark, who was openly ridiculed at dental meetings before finally being accepted! The NTI-tss bite splint can drastically reduce or even completely eliminate migraine headache. It is simple, effective, and relatively inexpensive, especially if you are spending money on pain medications. Take a look at the YouTube video of Dr. Boyd on Good Morning America, explaining how his device works! This FDA-certified treatment for migraine help will also work for stress headache in exactly the same way. The NTI migraine help bite splint just clicks on to your lower front teeth when you go to bed, and you wear it while you sleep. A lot of people ask me if there's any danger of swallowing it. The answer is "no". The splint should click securely into place. You should try to push it out with your tongue. If you can't do this, then the splint is tight enough. Because of the way you bite on the splint, it's also the best form of prevention against tooth damage from grinding your teeth at night. 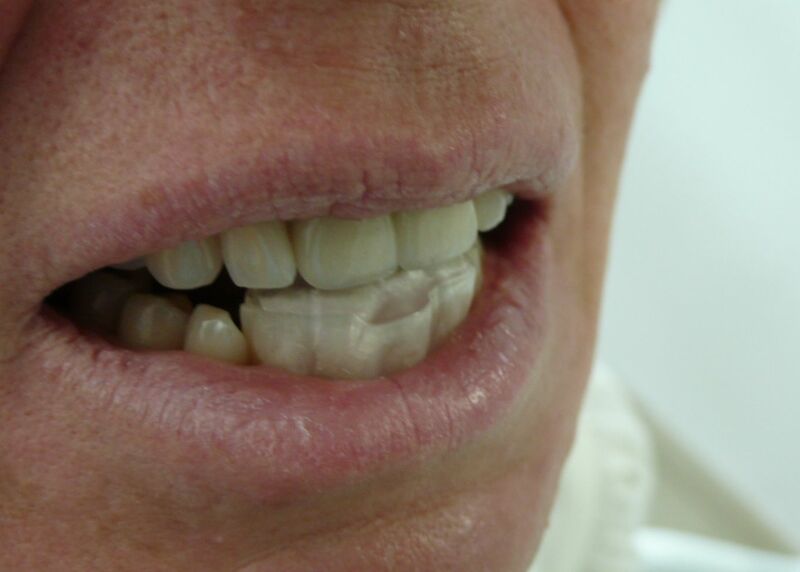 Only the upper front teeth can contact on the splint. There is a small space between all the other teeth. No contact at all. This means you can't crack a tooth in your sleep during an episode of extreme clenching! I wear one myself every night, as do most of my staff, and my son. BUT the NTI-tss must be made correctly and adjusted correctly. The precise shape and size is critical. Unfortunately, I have come across a couple of dentists who just make up the splint pretty much identically for every patient. But this is an error. It must be customized to each patient's requirements. I usually take an hour at the chair to make up an NTI accurately. I will go out on a limb here and state that anybody who does it in under 30 minutes has not done it correctly. The second aspect is that it must be reviewed AT LEAST once, preferably 2 or 3 times, over the following weeks and months. If a dentist does NOT review the NTI he has made, he is not following the instructions laid down by Dr. Boyd. For more information click here. It works in several ways. On the simplest level, it uses mechanics. Because only your front teeth can make contact, the jaw muscles just can't exert the same force as when your molars are in contact. I describe it as like using only the tips of scissors to cut tough material. If you're trying to cut a piece of leather, for example, it's really difficult to cut through if you're using only the tips of the scissor blades. On the other hand, you can get much more force if you move the material closer to the hinge of the scissors. The same principle applies to your teeth and jaws. If you can only use your front teeth, your jaw muscles can only exert about 25% of the force that they could if your molar teeth were contacting. 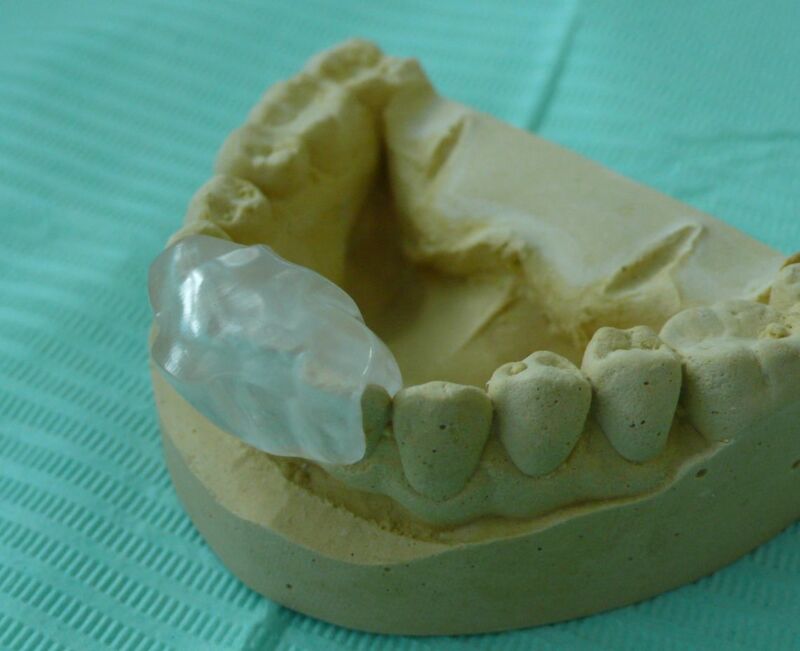 On another level, the NTI splint prevents any contact between your side teeth, top-and-bottom, and so prevents a reflex to bite harder. In fact, by only allowing contact on the incisor teeth, it actually triggers a reflex to tap your front teeth and then open your mouth a fraction! By protecting your jaw muscles from intense clenching at night, you are taking a huge stress off the muscles as well as the bones that they are attached to. It is this reduction in muscle activity that is at the root of this style of migraine help. BUT it's easy to call a bad headache "a migraine". Especially if it's come out of the blue; when you don't normally get headaches, and then you start getting bad ones all of a sudden. IMPORTANT - You should get your headaches checked out medically, by your doctor and maybe a neurologist. This is especially important if your headaches have started recently, and developed quickly over a short period of time. You might get a scan and a few tests. Once the doctors have made a definite medical diagnosis of migraine headache, you have a couple of options! You can see what the doctor recommends, or you can look for a dentist with experience in the NTI-tss splint. If the dentist doesn't find any evidence that tooth clenching or tooth grinding at night is responsible, you should look at OTHER OPTIONS. I HIGHLY RECOMMEND THAT YOU LOOK AT The Migraine Coach website. It's by far the BEST MIGRAINE website I have seen for non-dental migraine causes and solutions. Just click on the link for MigraineSavvy. Medical doctors usually treat migraine and stress headaches with drugs of some sort. In some cases, this style of migraine help can be the correct treatment. But in about 70% of cases, the drugs help with the pain, but not the CAUSE of the pain. And many people find that the medications make them drowsy. The NTI migraine help bite splint is a drug-free treatment option that I have found to be very effective, for myself as well as for many of my patients.